Provides symptomatic relief of acute and chronic pain. 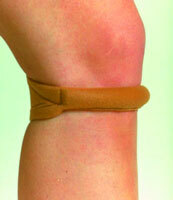 The strap functions dynamically as the knee bends and straightens. Pressure on the tendon below the kneecap helps guide the kneecap in the groove, improving tracking and helping spread pressure uniformly over the surface area. It also elevates the knee slightly, further relieving pressure. Tricot-covered (1/4)" foam strap with Velcro® closures in the back. Strap should not be worn to bed. Size; measure leg circumference just below kneecap.